Japanese 250 GP rider Taro Sekiguchi has suffered a broken pelvis and two fractured ribs after a high-speed horror crash in this morning’s warm-up session. 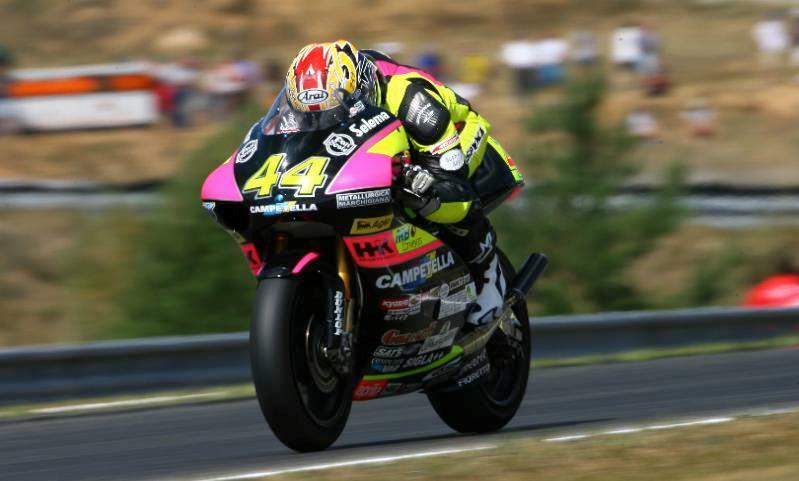 The 31-year-old was violently catapulted into the air when he struck Marco Simoncelli’s Gilera machine. Simoncelli had crashed out having run wide onto the kerb in a fast right-hand corner. The Italian’s bike slid into the middle of the track, kicking up a huge dust cloud in the process. Unsighted by the dust cloud and at full speed, Sekiguchi's Aprilia slammed into Simoncelli’s machine, with the sickening impact launching him in a 360 degree spin before he came to rest over 50 metres from the initial incident. He was taken by helicopter to hospital in Brno where doctors have confirmed Sekiguchi is conscious with no internal injuries. He should be well enough to be released tomorrow (Monday). The track was closed for over 40 minutes to clear up debris.